Indian Army has invited applications from Indian Nationals for Indian Army Recruitment in Assam for the following posts. The details of the posts and scale of pay and specification of the posts are given below. 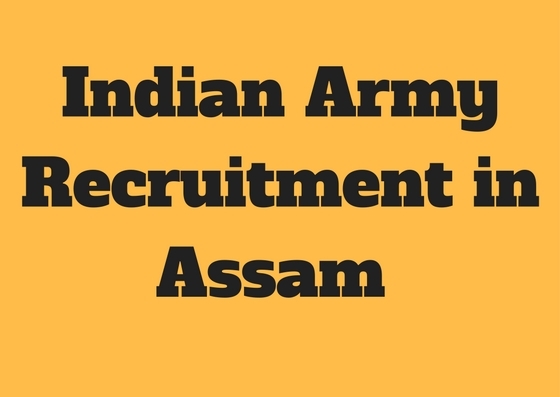 We have discussed the eligibility criteria and application process for the Indian Army Vacancy in Assam 2017 in this post. Moreover, we have also discussed the preparation for the Civilian post in Army Recruitment in Assam in this post. For this vacancy of Indian Army Jobs in Assam, You should be a Graduate in any discipline from any recognized University or Diploma in Material Management or Diploma in Engineering in any discipline from any recognized Institutions. (i) 12th Class or equivalent from a recognized Board or University. (ii) English typing @ 35 WPM on computer or Hindi typing @ 30 WPM on computer(35WPM & 30WPM corresponding to 10500/9000 KDPH on an average of 5 key depressions for each word). Matriculation or its equivalent qualification with a certificate in the trade of Tailor from ITI or equivalent diploma or certificate. Matriculation pass or equivalent from recognized Board. Must be physically fit and capable of performing strenuous duties. Qualification: Matriculation pass or equivalent from recognized Board. UR- 18 years to 25 years. OBC- 18 years to 28 years. ST/SC- 18 years to 30 years. The process of The Recruitment of Indian Army for Civilian posts is offline. Candidates will forward application properly sealed, in an envelope to the address mentioned against the post applied for through Ordinary/Registered/Speed post. Application carried by a person will not be accepted by the authority. Candidates must mention the word ‘APPLICATION FOR THE POST OF___________’ on the top of an envelope while sending the application form. Application without any superscription on the envelope will be rejected. Education qualification certificate. Class 10th mark sheet is mandatory. Certificate of ITI or equivalent diploma from recognized organization where applicable. Discharge certificate for ESM issued by Records Office/Regimental Centre or NOC from the competent authority for serving Defence Personnel who are completing the prescribed period of Army Service within a year from the last date of receiving the application . Certificate of disability issued by the CMO/Civil Surgeon of Govt Hospital for physically handicapped persons. Disability percentage of physically handicapped persons should be minimum 40%. Two passport size photographs, duly self attested, one on right corner of the application and one on Acknowledgement Card. Self addressed envelope affixing stamps of Rs. 25/-. Unlike Indian Army NCC special entry, there will be a written test for the above posts. Written test is consist of question papers of written test (objective type) will be in bilingual i.e. English and Hindi.